REVIEW: Amazon Prime Now - Free 2 Hour Delivery — Future Proof M.D. Before you get too excited, keep in mind "Prime Now" is only available in the following cities for now. Sorry readers outside these cities - be sure to take it up with Amazon! You can access Amazon Prime Now if you are an Amazon Prime member and live in one of the above listed service areas. You can access Prime Now online at https://primenow.amazon.com/ or via the Prime Now mobile app (Android or iOS). 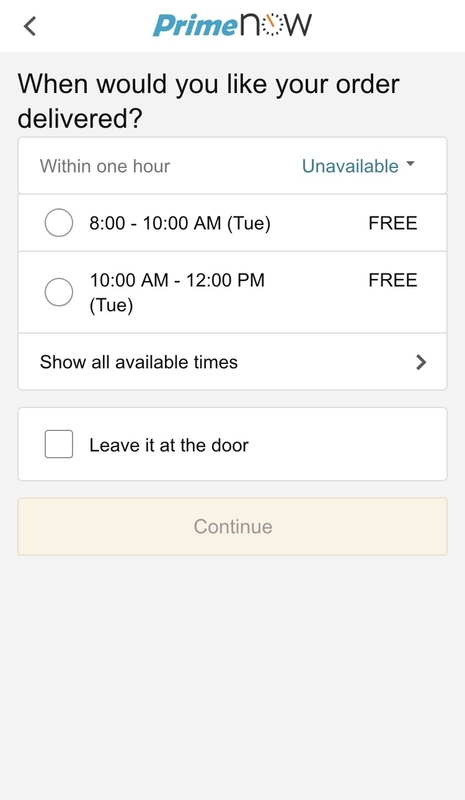 Compared to Amazon.com, the Prime Now UI is simpler and more intuitive to use. Take a look of them side by side. As you can imagine, in order for you to get your order in 2 hours, some compromises had to be made. Instead of the limitless selection available through Amazon.com, Prime Now only offers products in the following departments, and a limited selection at that. Also pricing may be a hit or miss as well. Luckily for me, I was able to find one of my favorite items on Prime Now. I'm a big fan of Mexican Coke - you know the ones that come in 12 oz glass bottles made with real sugar rather than high fructose corn syrup? I have been paying $1.39/bottle at Publix for them because I simply haven't been able to find them elsewhere. So imagine my delight when I find them on Prime Now for $21.49 - for 24 bottles! Ordering was extremely easy. If you have an Amazon.com account, you can shop on Prime Now simply by logging into your account. 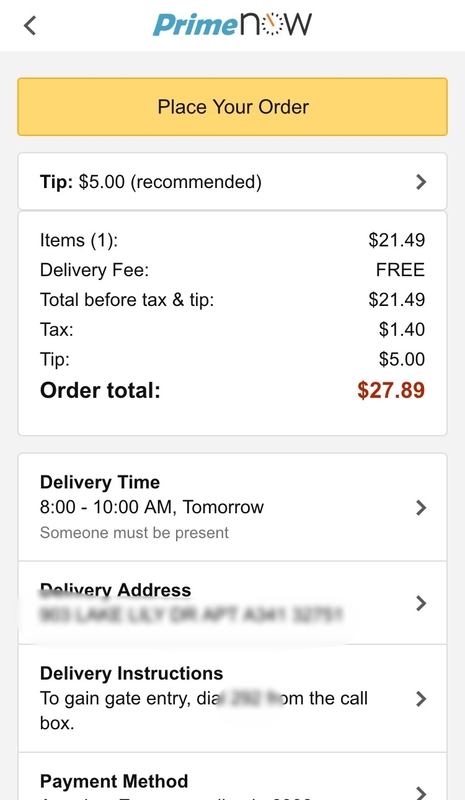 You can leave a tip for your delivery driver - in fact Amazon encourages you to by defaulting to a $5 tip. The good news is that you can change your tip amount up to 48hr after delivery. You have an option to leave a tip for your delivery driver - which Amazon promises to pass on 100%. You can change your tip amount up to 48hrs after delivery in case you have issues with the delivery service. What's really cool is that Prime Now shows your order on a map. Very much Uber-like. 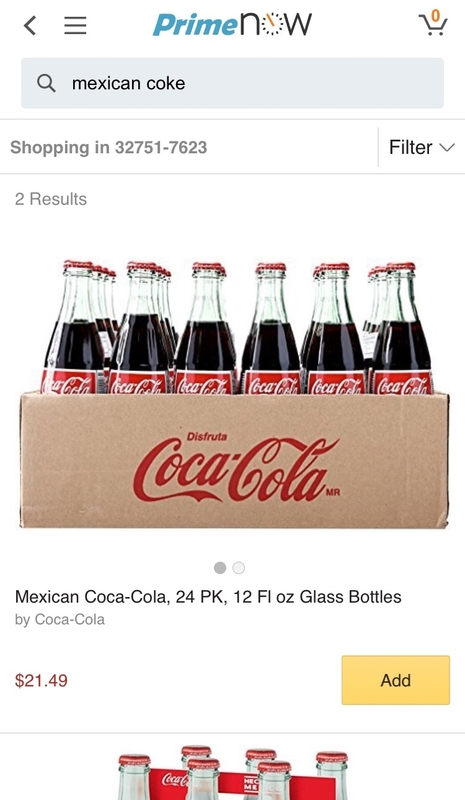 I selected a delivery window of 6-8pm for my case of Mexican Coke. My delivery arrived at 6:26pm. The delivery driver had some problems locating my address as I live in a big complex so I had to meet her downstairs. What's worse was that I had my dog with me and she didn't even offer to help me carry the coke up! In the end I took away the tip I was going to leave because I feel like I didn't get the delivery service promised. Prime Now is an awesome idea - it's like Amazon and Uber got together and had a lovechild. Just like Uber, your experience may vary depending on the delivery driver. Sure you are limited in your selection and it's currently limited to 27 cities. But I have no doubt Amazon will continue to expand the service to include more items and locations. If you are lucky enough to live in one of the Prime Now cities, there is no reason not to try it. To sweeten the deal, Amazon is offering $10 off your first Prime Now order with the promo code 10PRIMENOW.